This will be the gallery’s second solo exhibition with the artist and will include ten new paintings, all of which will display her continued interest in unseen and unknowable forces in nature, as well as a Taiko drum that the artist has commissioned for the exhibition. Known primarily as a painter, Brzeżańska works in many mediums, including video, photography and ceramics. For ‘This all occurs quickly, with ease, grace and joy’ she worked with a master drum-maker to construct a Taiko drum, which she subsequently learned to play and with which she has also traveled through Poland by boat. In Japanese folklore, Taiko drums have mythological origins. Through history, they have served in military action, as theatrical accompaniment and performance and, in particular, for religious and spiritual purposes. Brzeżańska’s drum summons energies and vibrations, to investigate the physical activation of space within the paintings themselves. Such resonances can be also found in the painted works, which pick up on the visual vibrations and energies that emerge from form and colour. The paintings in this exhibition incorporate at once abstraction, forms in nature and elements of language. Brzeżańska has researched widely in the fields of physics, spirituality and esotericism. These works explore the possibility of a holistic relationship between nature and art, between the experience of the work and its creation, and an absolute continuity between the body and its relationship to the world around it. Exploring language and nature, the text formations in the paintings might be understood as ‘sigils’, or formally constructed symbols that generate particular energies or ‘spells’. Of necessity they are private lines of communication, or signatures, that work as personal narratives for the artist while at the same time generating their own formal, compositional logic. 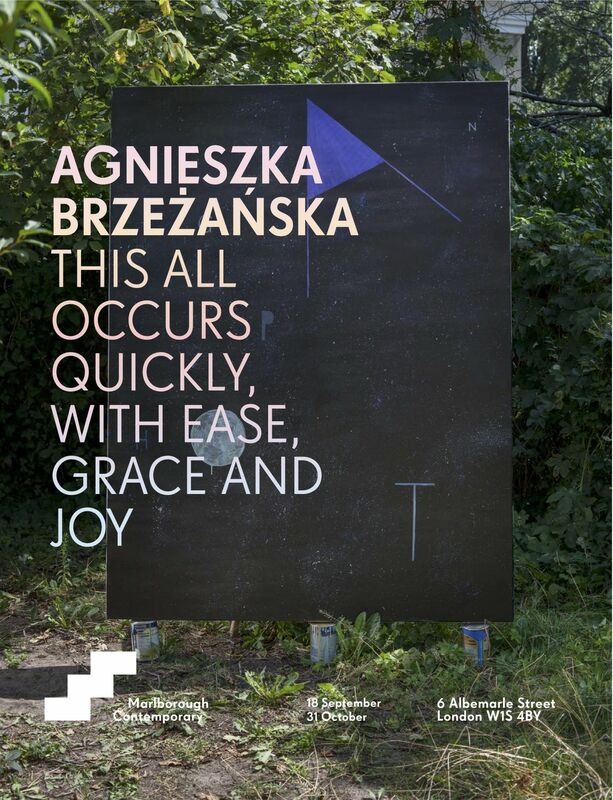 Agnieszka Brzeżańska works in painting, ceramics, video and photography. Her practice is marked by a performative quality to making. It constantly cross-references bodies of knowledge from science to philosophy, desire to spirituality. The work brings together a complex array of influences, which are rarely explicit and allow the work to open itself to heterogeneous components. Brzeżańska was born in 1972 in Gdansk, Poland. She lives and works in Warsaw and Berlin. Recent solo exhibitions include Wroclaw Contemporary Museum, 2015, Nomas Foundation, Rome, 2012, Kunsthaus Baselland and DAAD Galerie, Berlin in 2010. Her monograph, L’artiste, le modèle et la peinture was published in 2010 by Sternberg Press.